Balanced, well constructed, medium sized dog of Spitz type with prick ears and coat in varied colours. Length of coat should be such as to still reveal the body proportions. Medium bone. Important proportions , Length of back slightly longer than height at withers. The ratio of length of muzzle and length of skull is almost equal. Self assured, calm, even tempered with high resistance to provocation. Watchful and alert without being noisy. Very strongly developed link to his family. Reserved towards strangers without being aggressive. No hunting instinct. 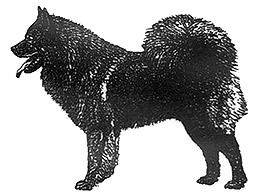 For the full development of these qualities, the Eurasier needs constant, close domestic contact with his family and understanding yet consistent training. General - Balanced, not too broad skull. Shape of head, seen from both above and sideways, is wedge-shaped. Planes of the bridge of nose and the skull are parallel. Flat forehead with distinct frontal furrow. Well defined occiput. Nose: Medium size, nose leather with black pigmentation. Muzzle: Neither too coarse nor too pointed. Tapering towards the nose. Straight bridge of nose and lower jaw bone. Lips: Edges of lips tight with black pigmentation. Jaws: Strong; broad arch to lower jaw. Dark, medium size, not too deep set nor protruding. Lid aperture slightly slanting. Eye-rims with black pigmentation and tight fitting. Set apart by about the width of the base of an ear. Medium size and triangular. Prick ears with tips slightly rounded. Tips of ears and centre of stop should form a nearly equilateral triangle. Strong, complete set of teeth (42 teeth conforming to usual tooth formation). Bite either scissor or pincer. Upper incisors either fit closely over lower incisors or meet. Pre-molars and molars set in one line without gaps. All teeth must be in vertical position to jaw. Of medium length, in balance with general appearance. Well muscled. Skin on throat tight fitting. Flowing transition to body. General , Seen from front, straight and parallel in position. Seen from side, moderately angulated. Upper arm and forearm of almost equal length. Shoulders: Well muscled. Slightly sloping. Upper arm: Medium length, well muscled. Forearm: Medium length, well muscled. Pastern: Medium length, seen from front quite straight, seen from side inclined slightly forward. General , Strong, not too short in back. Back: Firm and straight. Very well muscled. Loin: Of good length and width, very well muscled. Rump: Straight, broad and strong. Chest: Reaching to the elbows with oval shaped rib cage. Forechest well developed without being too pronounced. Sternum long, reaching well back. Lower line: Slight tuck up. General: Seen from behind straight and parallel. Seen from the side with moderate angulation. Upper and lower thigh of almost equal length. Stifles: Stable, not too straight [moderately angulated]. Lower thigh: Medium length, well muscled. Hock-joint: Not set too low, stable, turning neither in nor out. Hock (Metatarsus): Good length and breadth, vertical when seen from side. Oval; tight, moderately arched toes. Strong nails with dark pigmentation. Firm, well cushioned, black pigmented pads. Thick hair between pads. Straight set on, round and firm, of good thickness, tapering towards the tip. Bushy hair. Carried lying forward over back or bent slightly sideways or rolled up. When hanging down, reaching to the hocks. Ground covering with plenty of drive and good reach. All over the body is a thick undercoat and medium length, loosely lying, guard hairs. Short coat on muzzle, face, ears and front of legs. Tail, back of front legs, (feathering) and hind legs (breeches) covered with long hair. Coat on neck only slightly longer than on body, not forming a mane. All colours and colour combinations are permitted with the exception of pure white, white patches or liver colour. Lack of correct gender characteristics. Nervousness, shyness, excessive suspiciousness, aggressiveness. Entropion, ectropion. Eyes too deep set or too small. One or more incisors, or one or more canine teeth missing. One or more molars 1 or 2 missing.